Modifiers describe other words. Adjectives and adverbs are modifiers, and you'll learn more about them and how to diagram them with these exercises. 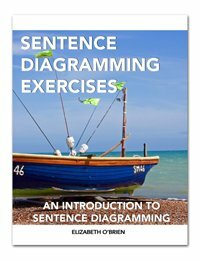 Sentence diagramming is a great way to SEE how the words in a sentence are related, and with these exercises, you'll be able to SEE how adjectives and adverbs describe other words. Adjectives are words that describe nouns and pronouns. They answer the adjective questions. (Which one? What kind? How many? Whose?) Sentence diagrams show us that adjectives describe nouns and pronouns. Directions: Diagram the following sentences by placing the adjectives on a slanted line under the word that they describe. 1. Two fat birds chirped. 2. That cute baby has been laughing. 3. Will my mother sing? 4. The green box fell. 5. The lovely, scented candle burned. Adverbs are words that describe verbs, adjectives, and other adverbs. They answer the adverb questions. (How? When? Where? Why? To what extent?) Sentence diagrams show us that adverbs describe verbs, adjectives and other adverbs. 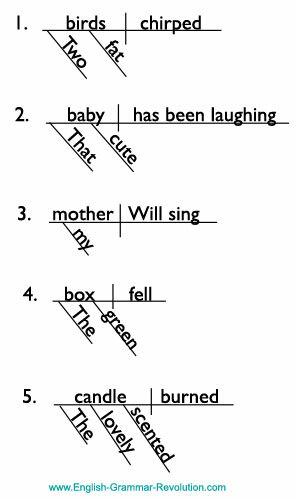 Directions: Diagram the following sentences by placing the adverbs on a slanted line under the word that they describe. 1. Walter ran very quickly. 3. May Rover stay here? 4. Thomas Edison worked diligently. 5. Very politely, Henry bowed. Directions: Diagram the following sentences. These sentences have adjectives and adverbs. 1. The little red bird flew gracefully. 2. The rather large book was sitting here. 3. Where did that large cat go? 4. My very favorite aunt sings beautifully. 5. Who has been eating so noisily? 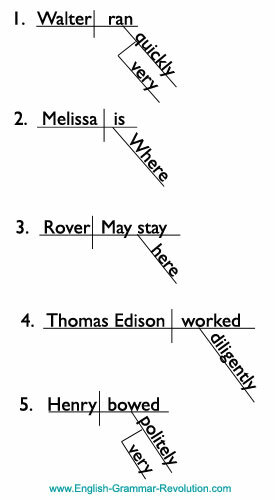 When adverbs modify adjectives, we put them on slanted lines under the adjectives that they modify. Go to Diagramming Sentences Chapter Three! Finished Chapter 2? Move on to Chapter 3.